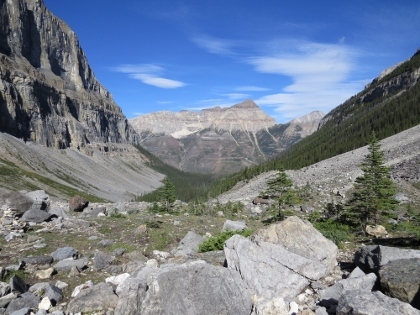 The Canadian Rocky Mountain Parks form a striking mountain landscape, that includes a full range of glaciation features and harbours the renowned Burgess Shale fossil site. The parks are aligned along the Continental Divide, separating the drainage basins of the Arctic, Pacific, and Atlantic oceans. Wildlife includes 56 species of mammals, 280 species of birds and 8 species of amphibians and reptiles. 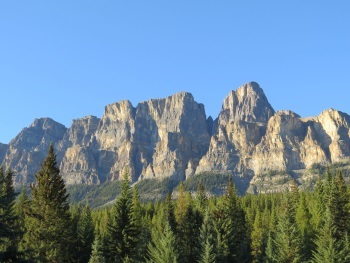 The designated area consists of four national parks: Banff, Jasper, Kootenay and Yoho. And three provincial parks are included: Mount Robson, Mount Assiniboine and Hamber. The parks are all contiguous. Banff National Park was already established in 1885, then only covering a small area around the hot springs (now known as "Cave & Basin National Historic Site"). Its highest peak is Mount Robson at 3,954 m.
Out of the 7 included parks, I visited 3 during my week long stay in this area: Banff, Kootenay and Jasper. Banff NP is the gateway to the Canadese Rockies and within reach of a day trip from Calgary. It sees an enormous amount of visitors, and this clearly affected my pleasure of being there. The mountain scenery is wonderful to look at, but I had not much luck in finding wildlife or a non-crowded medium level hike. Almost everywhere you are you hear the noise of the main highway from Calgary into Lake Louise, it was just like walking in the Netherlands again. What I did enjoy here was the Whyte Museum in Banff Town. This is the first proper museum that I visited in West-Canada. 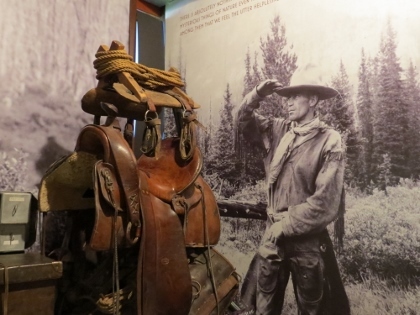 The exhibitions alternate between Rocky Mountain explorers from the late 19th century and Native American artifacts collected by the Whyte family. I also joined a short guided tour that lead us into the wooden cabins where the local Moore and the Whyte families lived. They both were great collectors, maybe we would even consider them hoarders nowadays. Kootenay is one of the smaller parks. It lies in a valley just west of Castle Junction in Banff, in the province of British Columbia. I visited it just to do a hike. I had opted for the ‘Stanley Glacier’-trail, a fine 4 hour hike through a burnt forest that is recovering. It ends near the glacier, where I sat down for a while and enjoyed myself with the hoary marmots and pika’s that ran around between the rocks. On my way to Jasper the warm and sunny weather that I had enjoyed in Canada for 10 days suddenly started to change. 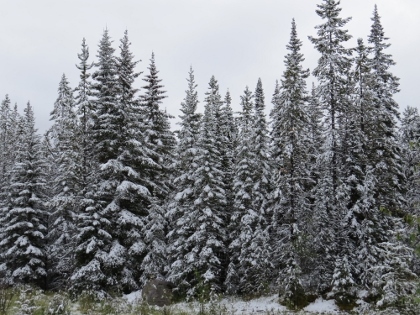 It was snowing near the Athabasca Glacier on the Icefields Parkway, and it also did in the higher laying areas in Jasper NP. I couldn’t even see the mountains anymore! Although it kept on snowing overnight, I was able to visit the valleys without a problem. I drove up and down the Maligne Valley, resulting in the sighting of some Elk and Bighorn Sheep. In all I think it’s easier to see wildlife in Jasper then in Banff. I also saw a coyote near the road into Jasper town. And I hiked the ‘Valley of the Five Lakes’ trail, a shortish but very scenic hike around (indeed) 5 small lakes. 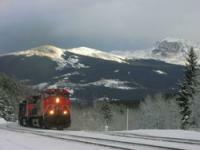 The whole of the Canadian Rocky Mountain Parks is a huge area to be covered for one WHS. We have a connection for "Smallest natural WHS", but this must be one of the largest. (Oops - we already have a connection for largest too, and the Rockies aren't in it by far!) Besides Banff and Jasper, it would have been nice to have 3 nights in the area of Lake Louise or Field. But no matter how long you stay here as a tourist, you will never do it enough justice. One of my personal goals during my two years term in US is to visit the Canadian Rocky, so I successfully persuaded my friends to make Calgary to be our final destination of our US road trip in Canada! After potato adventure in Idaho, our group reached Spokane in Washington, at first we planned to visit Glacier National Park, but after got a telephone confirmation from a park ranger that the famous Going to the Sun was still closing, my friends voted unanimously against my original plan and decided to change for shorter route directly to Banff, what a miserable day. By a super fantastic GPS in our car, we drove for 9 hours and reached our hotel in Banff almost midnight! No surprising that next day the only thing I wanted to do was leisurely walking in the city for nothing. I really enjoyed Banff; the city’s surroundings were just amazing with dreamy mountains especially on sunrise and sunset. On the way to Jasper by the scenic Icefields Parkway, we saw the famous Lake Louis and Lake Peyto, these two lakes were stunningly beautiful, the mountains were again magnificent at its best and the lakes were equally impressive with unbelievable turquoise color. We decided to have lunch at Fairmont Chateau Hotel; the food was equally excellent with the view. It was my dream to take photo at Spirit Island at Lake Moraine. The island was again such a beauty place on earth, no wonder of its reputation. Visit the area in late spring was quite a problem, some small roads were still inaccessible, and our GPS always took us to those roads making the trip more complicated. We spent only three days in the Banff-Jasper area, even though during the road trip we saw many stunning mountains and lakes like Grand Teton and Sawtooth, the mountains and lakes in Banff and Jasper National Parks were much more impressive and make us wow in every turns of the road. Coming from the very flat country like me, Canadian Rocky was one of the best places on earth to provide a definition of what mountains should be. We ended the exciting two weeks road trip at Calgary Airport; the only regret for me was that I saw only 2 World Heritage Sites from 5 in my original plan, but that’s the charm of the road trip, and really made me want more road trip to discover the natural wonders of this continent. Banff, Jasper,Kootenay and Yoho are all amazing parks. We began our trip at Lake Louise and traveled north on the icefields parkway to Banff and later Jasper. Stopping all along the way. On the way back, we hit Kootenay and yoho before heading to Waterton Glacier and Glacier. It was an incredible trip. the icefields in these parks were still evident. Elk and deer were everywhere. Hiking was incredible and offered opportunities for even those looking for an easy path. The water, due to the mountain sediments is an amazing color! Each area has something special to offer and there are a lot of wonderful waterfalls. I think Mt Edith Cavell was one of my favorites! In 1974 I visited all 4 of the national parks listed here (plus Waterton Lakes National Park, which has its' own Heritage listing, and both Glacier National Parks, in Montana and in BC). I'd spent summers in Colorado and thought I knew about mountains, but that '74 trip thru Alberta and BC opened my eyes as to what real mountains are like. From Banff all the way to Vancouver, one incredible view after another, non-stop natural beauty. That trip ranks as my favorite out of many. If I had the time, I'd strongly recommend visiting these parks! I'm really glad that UNESCO has seen fit to declare this collection of parks as a World heritage Site. these parks contain some of the most beutifull mountains in the world. there many hiking trails to walk on, each one is different to the others. i have visited these parks twice, and both times they have been great. lake Louise is crowded around the viewpoint, but if you go on the trails, there are very few people; and lake Louise is stunningly beautiful. my favorite park is Yoho, it is less crowded then a lot of the others, and has the incredible Takakkaw Falls, one of the highest waterfalls in Canada. these are some of the oldest national parks on earth (created in the late 1800s). enjoy your trip! Banff: We camped for two nights (first campground was at Johnston Canyon, the second at Lake Louise). Both had excellent facilities, especially hot showers, which we appreciated. The hikes to both Lower and Upper Falls at Johnston Canyon was 2.7 km long and worth it. Each turn of our hike had a really lovely view of the canyon and gushing water. Lake Louise did not disappoint and it's as turquoise as it has been in my dreams. I have been waiting 15 years to visit this gorgeous setting. A World Heritage plaque is located in front of the lake, as well as in Banff town, only two buildings from the visitor's centre. Also worthy visits are to Moraine Lake and Peyto Lake. Kootenay: We took pictures at the continental divide sign and walked through the short Fireweed Trail that was devoted to the burnt forests of Kootenay. The park still has forests and forests of burnt trees for you to see as you drive through. Some fun destinations within Kootenay are Radium Hot Springs (worth the fee to have a relaxing soak - don't forget to show your park permit for a discounted fee) and the Painted Pots, which are small clay pools of different colours that were used by indigenous people for face painting and decoration of tipis. Yoho: Less than a half-hour drive from Lake Louise, it would be silly not to visit if you're already in the vicinity. We drove to Emerald Lake, which was a short drive from the visitor's centre in Field. If you are pressed for time as we were, it does not require hiking a trail for you to enjoy the beauty. The town of Field itself is also a fun and quick drive. We located the elementary school, 2 restaurants, and the post office within seconds. Very quaint! Jasper: From Peyto Lake in Banff National Park, it is about 80 km to drive to the Icefield Centre, the visitors' entrance to Jasper National Park. You can see one of the park's highlights, the Athabasca Glacier, across the street from Icefield Centre. We camped 1 km south of here, and the campgrounds were rustic but adequate and scenic. A waterfall was heard gushing closely to where we set up our tent! Other sights to visit within the park are Mt. Edith Cavell, the Angel Glacier, and Maligne Canyon. I wish we'd had more time to go to Maligne Lake but it was over 40 km out of our way so we settled for the canyon. The town of Jasper was much more charming to me than Banff town, which is swarming with many tourists. Overall, the Canadian Rockies are glorious. I know I will always remember this trip! I agree with Jessica and Kerri, I found the Rockies a thrilling place to visit. What more do you need than all that beautiful mountain air! You really can get away from it all. Although also enjoy the nightlife in Banff when you fancy some partying!. Having lived in the town of Jasper in the Canadian Rockies, I have been hiking through the Rocky Mountains a lot. It is a great place and there's so much to see. Of course, Jasper and Banff are touristy towns with crowded hiking trails, but if you look a bit further or visit the place off season, you can wander around all alone. And even when you do visit the most touristy sites, you are still impressed with the magestic mountains, the thundering waterfalls, the cold glaciers and the wandering wildlife. The parks are all contiguous, and the easiest entrance from abroad is via Calgary Airport. There's a bus from the airport directly into Banff. To get further afield, you have to rely on a rental car or organized tours. Tea Houses: Twin Falls Tea House in Yoho NP is a designated Canadian National Historic Monument recognising its significance for its construction methods/design (Rustic) and its role in the early days of Hiking as a recreational activity. Reintroduced Species: Elk/Wapiti were thought to be "extinct" in Banff by the early 20th century and a number were brought in from Yellowstone - the numbers of elk are now a problem! Similarly in Jasper NP. Situated on a Continental Divide: AB evaluation :- "The four parks are aligned along the continental divide - which marks the hydrographic apex of North America separating the drainage basins of the Arctic, Pacific, and Atlantic oceans." At Snow Dome waters debouch into the Atlantic (via the N Saskatchewan River and on into Hudson'ds Bay), Arctic (via the Athabasca River) and Pacific (via the Columbia River ) Oceans. Fatal Accidents or 'disasters': Due to bear attacks in Jasper and Banff NP's, 5 deaths have been reported. 205 Community Members have visited.